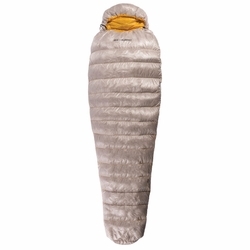 Sea to Summit Spark Sp 1 Sleeping Bag. Ultra-Dry Down protection and warmth in a minimalist package. Using 850+ loft goose down treated with the amazing moisture repelling Ultra-Dry Down, a micro-weight 10D shell and 15D lining, the Spark is one of the best warmth for weight minimalist sleeping bags available. The Spark is an ultra light bag with several key uses. Its balance of size, weight and warmth make it an excellent summer sleeping bag, especially for cycle touring and ultra-light hiking. Its size and temperature rating means it can also work well as a booster bag, slipping inside another sleeping bag to add warmth. The protection of Ultra-Dry Down makes the Spark ideal for summer alpine use and adventure racing, where heavy weight is not tolerated and where until now down has not been a viable option. The secrets of the Spark's amazing warmth to weight ratio are in the premium quality down, micro-weight shell and liner fabrics, the 1/3 length #3 YKK zipper, and the sew-through transverse baffle construction. The shell, lining and other components combined weigh less than the down insulation inside: 6.3 oz for the down versus 6 oz for the rest of the bag. Plus the Spark compresses so small, Sea to Summit had to re-engineer their compression sacks to make one that reduced sufficiently.